Due to lack of registrations we need to cancel the tour, unfortunately. 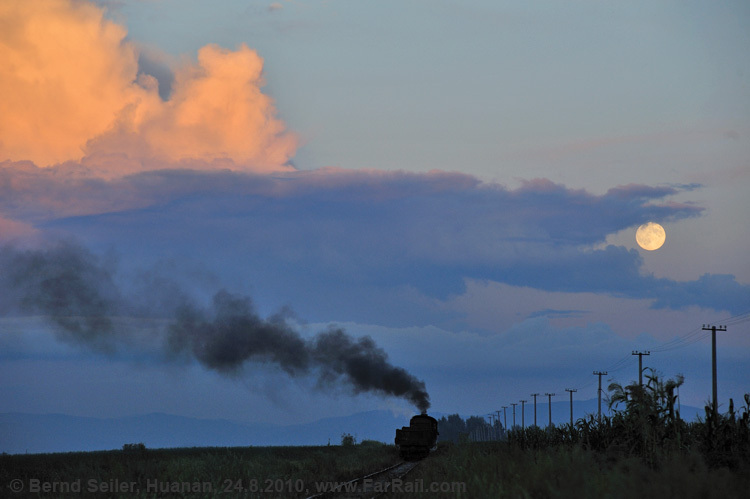 When Shibanxi stopped its freight service in August 2012, it was believed almost all Chinese narrow gauge steam was lost. 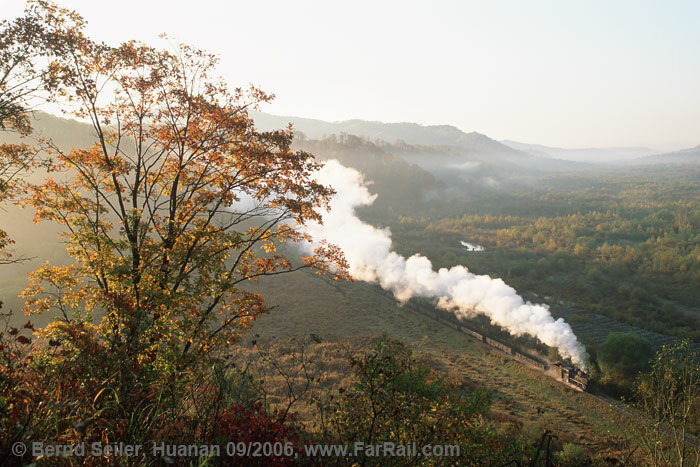 Then we got a permit for Rongshan, the world’s last non-tourist real revenue earning narrow gauge steam line. But in the north, two forestry lines have also survived  and after Xinglongzhen recently repaired their C2, both can now offer a C2 steam locomotive for charter trains. In addition to these two, Huanan is not completely dead either. They lifted the track between Lixin and Honguang, but the rest is still in place and operable. On all three lines it’s possible to run quite authentic looking charter trains  and this is what we’re going to do. Enjoy Northern China at a time when forests are colourful, temperatures are fresh but still pleasant and the morning chill guarantees wonderful steam exhaust effects. The logging season starts later in the year, so we’ll take one of the usual coal trains from Huanan to Lixin and back (empty) and mixed freight trains on the other two lines. Huanan can’t run charter trains in winter, but the autumn colours there are stunning, which applies to the other lines as well. For the planned tourist operation, Huanan will not need the old coal wagons, so chartering authentic looking trains has an expiry date. For all those who missed the line in its real days this is your chance! 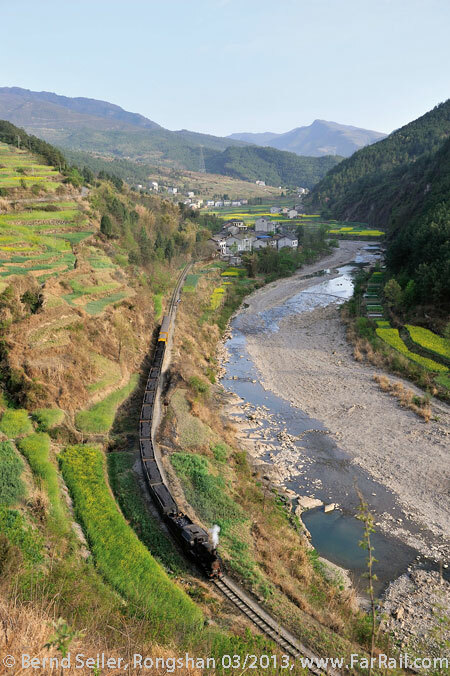 Before we’ll enjoy the colourful forests of northern China you can opt-in to fly with us to Sichuan province to visit the coal railway at Rongshan. This line runs through a fantastic mountain landscape. September is the time when the rice harvest is in full swing. 27.09. 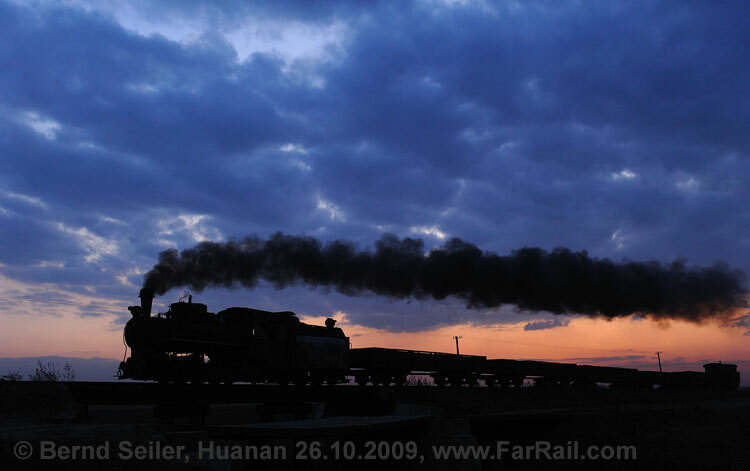 Flight back home, arrival (in Europe) in the same evening or continue with the narrow gauge lines in the autumn forests of Heilongjiang. 30.09. Charter bus to Suileng, visit to the depot (diesel locos and one C2). Hotel in Suileng. 01.10. 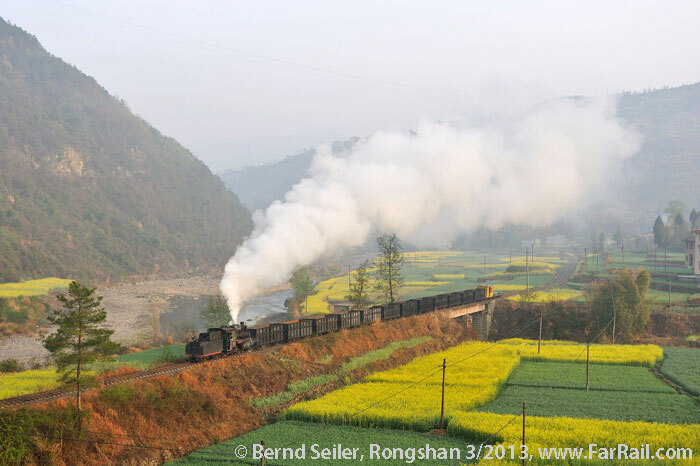 Full day charter train with photo runpasts from Suileng probably up to Jianxing. Accommodation in a typical forestry workers house which we would rate with one black hole (see below). Cold water for washing is available. 02.10. 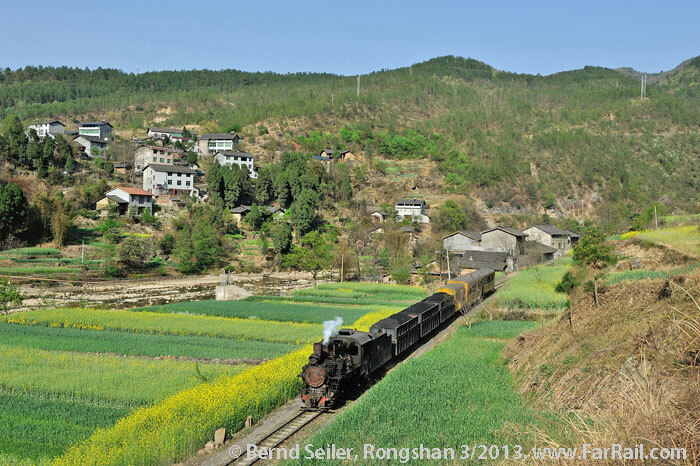 Full day charter train from probably Jianxing back to Suileng. Hotel in Suileng. From the former system only the line from Huanan to Lixin remains. Most of the line was cut back in the 1990s. 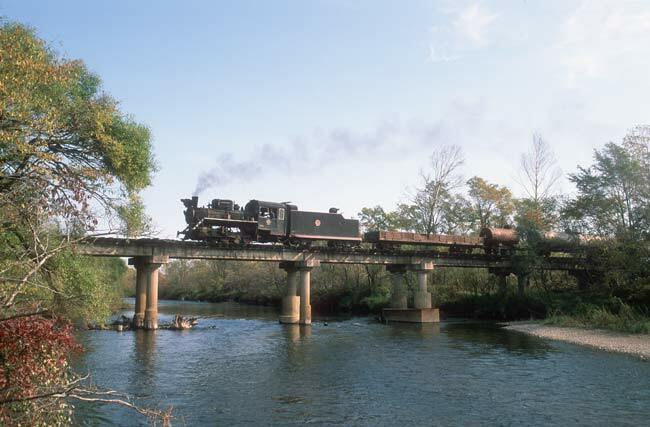 In 2003 they ran their very last logging trains. Since then, and it was a surprise that it lingered on so long, they’ve run only coal trains from the little mines in Hongguang. In 2011, they improved the road to Hongguang so that trucks could reach the coal mines more easily. In April, we witnessed one of the last coal trains from Hongguang and didn’t think that we would ever come back to this lovely line with its stiff gradients, at least when the track lifting trains headed for Hongguang and came back with rails. But they have a plan to make the line a tourist attraction and left the section Huanan  Lixin alive. Rarely has anything moved over the track since the last works trains with rails, but to a charter train request they replied, “yes, we can”. They still have seven serviceable coal wagons which would form a nice train. They can’t run in winter because they would need to shovel the line free. It would be possible but very expensive. You would need a massive number of people who would do it  and those who know the line and the possible wind will agree that it would be very risky to invest such money. We have seen it that after a train break of six hours, the wind has made the line impassable and the workers have had to shovel snow away all the day  only to find that the rails at the first places where they removed the snow have been blown over by snow again. Please expect around six wagons on our train. It is not unlikely that after such a long time standing idle in the yard, that one or two of the wagons will not be able to go on the line. We’ll follow the train with our charter bus as far as Tuoyaozi and afterwards we’ll board the train. Please be aware that the train has no comfortable seats and might be dirty. We’re probably travelling in coal wagons  what kinds of comfort can you expect? It’s not a luxury charter train event with a 3pm tea and flushing toilets in the non-existing coaches; it’s a train to make railway photographers and video film makers happy. Near the summit the line passes through forest which should be very colourful at the end of September. The rest of the line sees many little fields and villages. 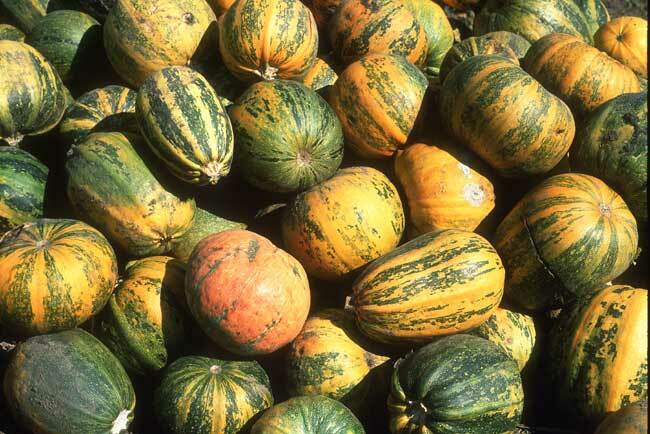 The pumpkin harvest should be underway, which is a nice sight. 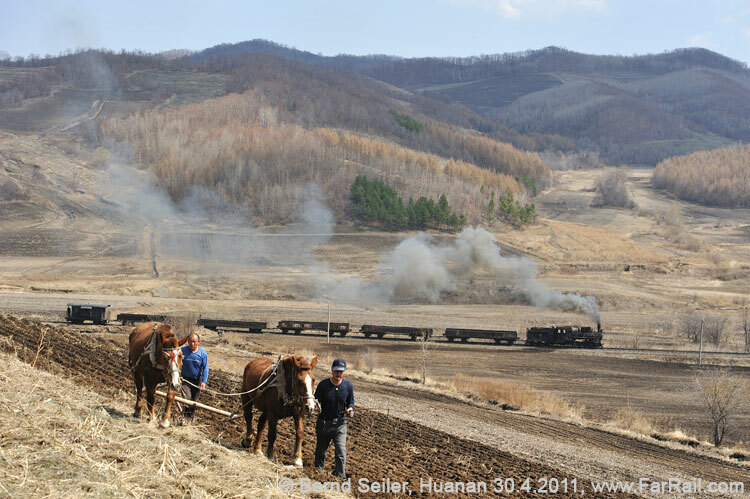 Some of the farmers still use horses in their fields and when we see one, we’ll stop our train to include the traditional farming in the picture. It’s one of the Chinese miracles that this line is still alive. I’ve heard several shut-down dates, but none of them has materialised  so far. Although they established a small tourist business about a decade ago the future of this system is not safe. Suileng is still a forestry line, during the off-season they carry some general goods. Not many trains will be around in Autumn, so we have plenty of time for our charter train. Our train will be hauled by a diesel loco. Only for the runpasts we’ll use the steam loco. The water in the tender needs to be sufficient for both days as there is no water supply on the way. This will limit the number of possible runpasts somewhat, but we’ll get many photos nevertheless. We’ll travel in one of the tourist coaches. My trip report from 2005 covered the line. 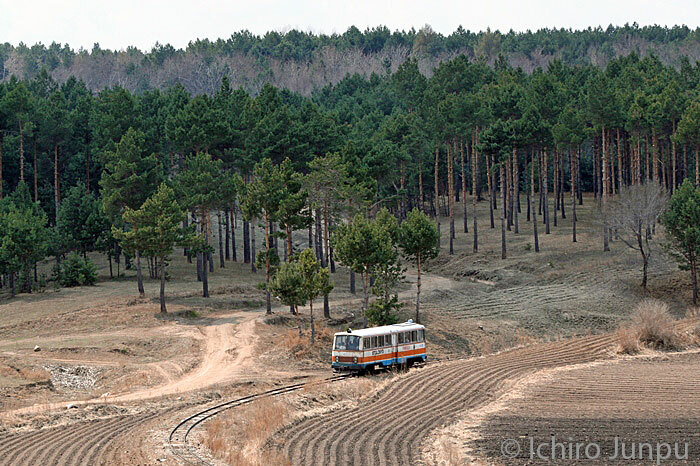 This forestry railway, to the north of Haerbin and Suihua, was built under Japanese rule before the revolution. 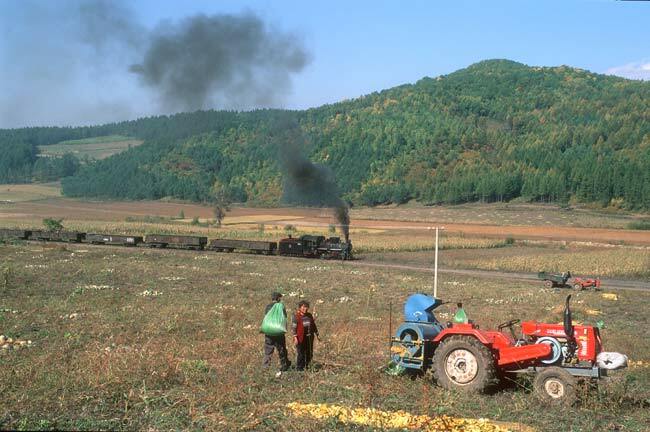 The closures of parts of the railway started when the felling of trees ended (because no new trees had been planted the supplies were depleted) from 1997 in Dongguliu. The former mainline to Baer (km 124) was temporarily cut to Bayi and, after the closure of the branch to Dongguliu, the line was cut to Zhongleng near km 98. In 2000 the branches to the south of Xibeihe to Dongfeng and Wusi were closed. 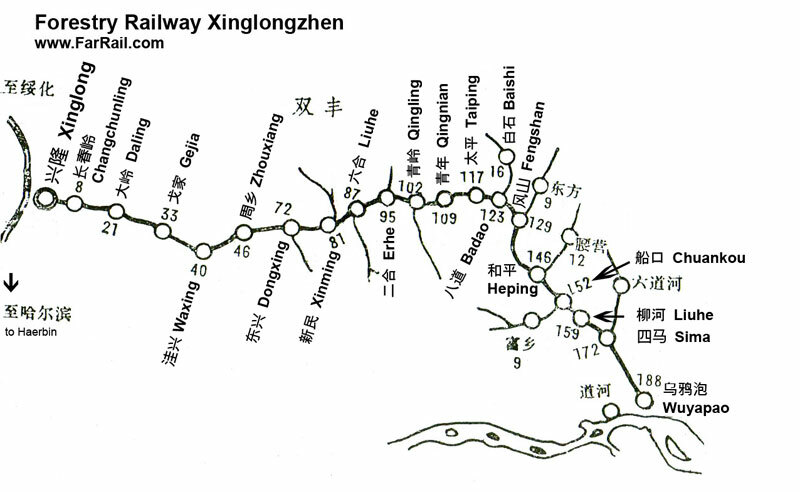 By 2001 the lines from Wuji to Shitoushan, the network of Wuchang and several small branches like for example the one km long connection to a wood loading point to the west of Shitoushan (km 10 behind Liukesong) had been shut down. Since then there have been no further closures. The branches to the loading points around Wuchang, Dongguliu, Wuyi, Dongfeng and Wusi have all been removed. Wood is only loaded in Zhongleng, Yuejin and Beixihe. Limestone is loaded 4.1 km to the north of Yuejin and sand is moved from the 2.5 km long branch to the south of Zhangjiawan. 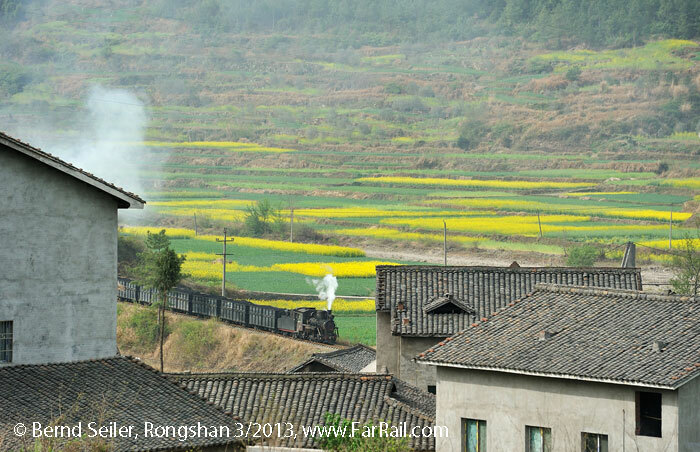 The railway runs through swampy, flat land and reaches more hilly, partially wooded terrain near Xibeihe (km 79). There are no steep gradients which require double heading or banking. Wood is moved from the middle of November to the middle of April, and limestone the entire year. In the wood felling season there are 4 to 5 pairs of trains a day. A complete roundtrip takes 10 to 12 hours. There are approx. 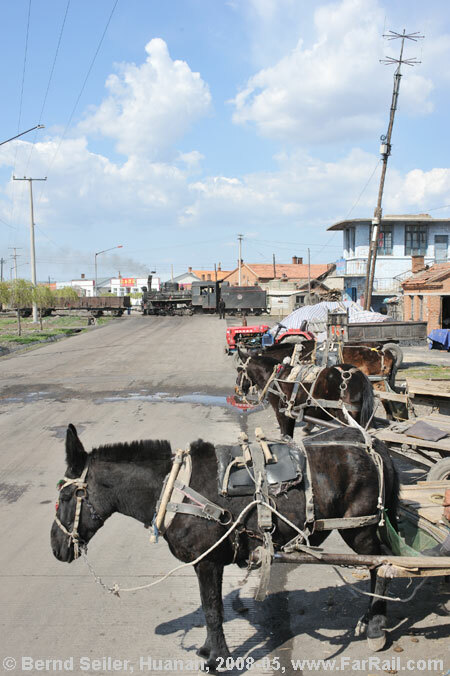 2 limestone trains a week, each with 25 wagons. In the steam age the log trains consisted of 25 to 30 wagons. Since dieselisation 30 wagons is standard. Sand is transported irregularly, with mostly short trains. When requested, other goods, like fertilizer and coal are transported. 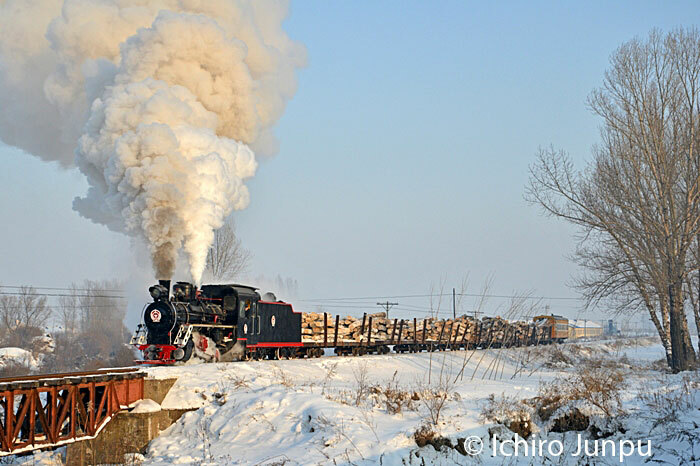 In the summer months tourists are moved in a specially prepared railcar, no.5, and a red passenger coach equipped with modern video equipment and modern windows, to the Ruamin River. A 1.1km long branch line, which starts at km 71 has been specially built for this traffic. With the first line closures and cuts in freight in 1997, diesels took over entirely. Only C2 no. 021 was stored as a "souvenir" and can still haul short specials despite its dire technical state. In the depot there is a further C2 (scrap condition), whose number is thought to be 202. Specials consist of a diesel, a red passenger coach (the one for local tourists), the steam engine and any wagons you request. At each photo stop the diesel and passenger are uncoupled. When you chose the photo stops you should consider the fact that there is no possibility to take water and the quantity in the tender has to last for the entire trip. Once the tender is empty, you've had your last run past. C2 021 hasn't had any exam or major repair since 1997. It's close to a miracle that this machine can still move under its own steam. Of course it can't move many wagons. Boiler and cylinders leak here and there, so that you shouldn't run a special in the depths of winter, as the engine would be completely enveloped in its own steam. The left crank was broken and only fixed with a piece of steel wire. The injectors leak more valuable water than they actually inject. On its last trip, nobody believed the engine would make it to the end of the long tour. But she did make it! At the end of the two day tour, she could even move into the depot under her own steam. Number SN98801 is used as spare part donor. The diesel engines only have one real drivers cab. Because of the abandonment of various triangles they have to run backwards for the last leg of their journey. There are still triangles in service in Sihaidian, Zhangjiawan and Liukesong. These are also used by railcars. There are five railcars with the numbers SN05 to 09 as well as two maintenance vehicles with crane numbered SN 10 and 11. There is a regular passenger service operated by the railcars. Usually a passenger coach is added. As these are all painted red, they are no good for a special. The timetable which is valid from 16-08-2005 also contains trains which don't run regularly. Suileng will be closed in spring 2014. Track maintenance has stopped almost completely and it can't be guaranteed that our loco will make it all the way without a derailment. This is another forestry line which survived despite never ending rumours of its closure. They had a C2 for charter trains, but the condition of the rarely used loco got worse and worse so they stopped offering steam charter trains for some time. In 2012 however the C2 had an overhaul and is now available again. 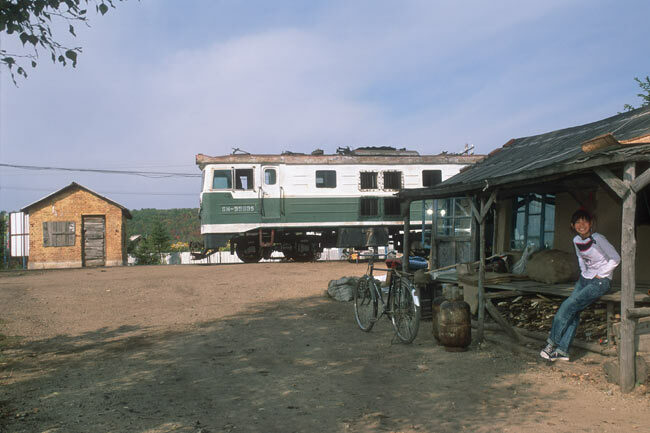 On the forestry railway Xinglongzhen there are only diesel locomotives in use. For tourist trains which may run during summer for Chinese tourists they keep one C2 in working condition. We can’t run one of the logging trains because we’re there off-season. Usual logging trains are much longer than a special could be (they would offer a maximum of five wagons instead of trains with more than 20 as they used to be when steam was the only motive power on this line). In addition, the logging season is the winter, not the autumn. However, most of the forestry lines used to run ordinary freight trains as well, mainly to deliver maintenance equipment to the far branches of the line, transport sand, stones, coal and farming equipment. 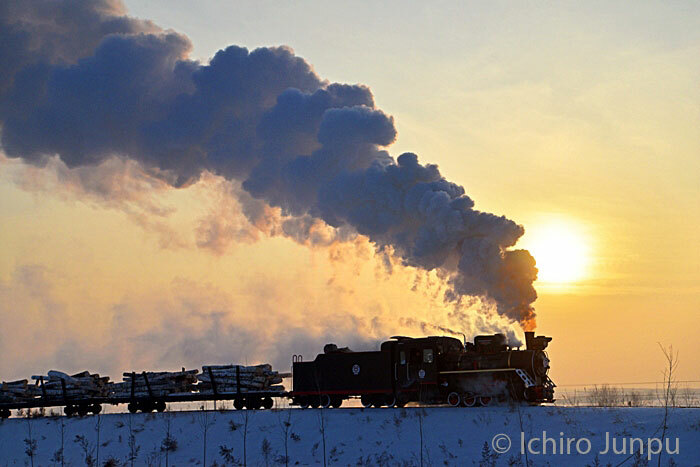 We’ll charter one of these authentic freight trains. The scenery is typical for north Chinese forestry lines. 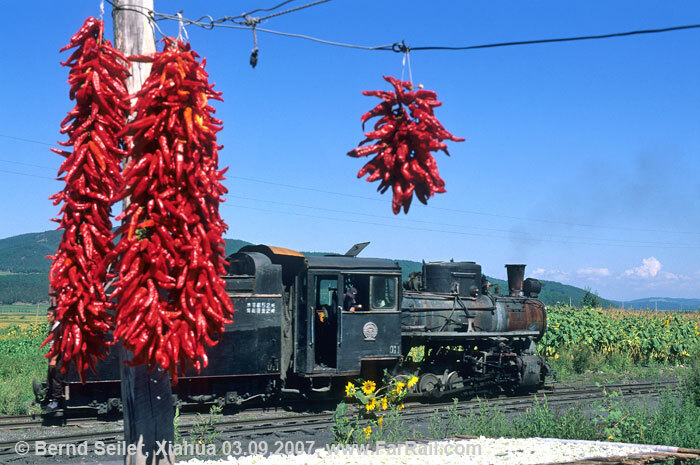 Do not expect tunnels or high viaducts, there are forests, rural villages and hills which make this line charming. The countryside is very much as described for the line of Suileng. Because the line will be closed in spring 2014 track maintenance has stopped already. The shape of the line is very bad and doesn't allow our steam loco to go over the entire remaining part of the system. We’ll try to convince them to bring the steam loco by diesel overnight to the forests. The middle part of the line is in a very bad condition and they can't guarantee that our steam loco will make it to Dongxing without several derailments. In the mid-1980s four brand new C2-locomotives were delivered to the line. 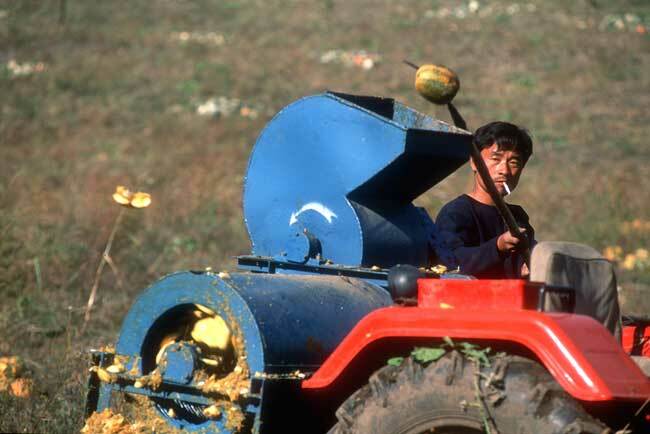 It's remarkable that they came from Haerbin Forestry Machinery Factory; probably the only ones in Sichuan province. Their nos. are 210, 211, 218 and 219. Two of them should be in use for shunting operations and line service. The narrow gauge line starts at its lowest point in Rongshan. There was one line to the north-east to "No. 5", a coal mine in Gaokeng. This line was some three kilometres long. The production of this coal mine dropped as early as the late 1990s, with only one coal train a day serving the line in the last years. The earthquake which shook the whole of Sichuan province damaged the line, so that they gave it up. The other line is still in service. It is about seven kilometres long and winds through a scenic, rural and sometimes narrow river valley. The terminus, mine no. 1" in Yujiabian, lays roughly 50 metres higher than Rongshan. As there is no road access to the mine (there is only a bumpy and narrow road on the other side of the valley which is connected to the village and mine by suspension bridges) the line still survives today. 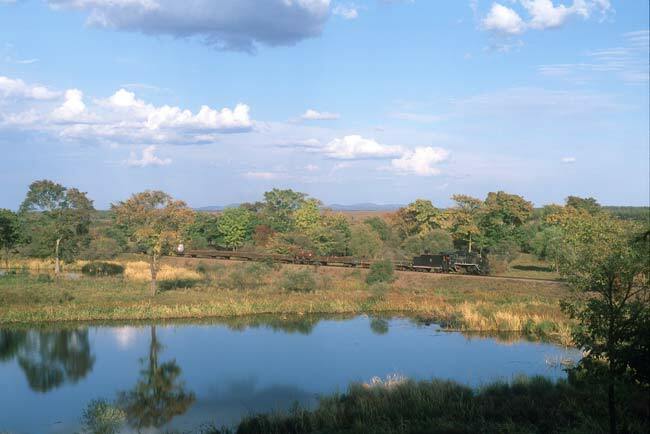 During its heyday, the railway had more than ten locomotives. Nowadays one or two locomotives can handle all the traffic. We expect to see two to three pairs of trains a day. The tour is planned with the dedicated photographer and video filmmaker in mind. The itinerary is designed for those who think it more important to get the perfect shot in the morning sun than a substantial breakfast. Lunch can be provided as packed food if the situation (i.e. taking pictures) requires. Lunch might also be skipped if the situation requires. It is possible that some of the lines will be unable to run the planned charter due to severe weather conditions like floods, engine failures or other reasons. We can’t promise any compensation in such a case. Please keep in mind that two lines have only one serviceable engine which is used rarely and at least the one in Suileng didn’t see a proper workshop from inside for many years. They replaced some parts, which are usually made from steel, with wooden parts! Be prepared that not everything will work according to plan. We’ll try to make the most out of it. We expect the lowest morning temperatures to be a little above zero degrees Centigrade (about 32 degrees F) while afternoon temperatures can still reach more than 20 degrees Centigrade (low 70s F). In Beijing temperatures may exceed even 25°C. The hotels used will be of medium class, but in remote areas sometimes they are more basic. To give such places like forestry accommodations a star-rating, we extended the well know category system of how to rate a hotel’s service and comfort to the bottom end. Zero stars would be too good. The accommodation in Yuejin on the Suileng system is another matter. Unless things have changed in a positive way since 2005 there are facilities outside but they can hardly be recommended. They have a simple washing room with cold water available. If you ask somebody about washing your hands he would point to a bowl with some water in  sometimes used by several others before. If you want something clean to wash in, you have to ask for fresh water or do it as the locals do  go to the river! The accommodation and the bedding might not be very clean. So you should bring a towel to put under your head or a light linen sleeping bag or sheet. With this equipment you can easily stand a night in circumstances that the locals have to use all their lives. The accommodation in Yuejin is rated by us as one black hole. Lixin on the line of Huanan was rated as a three black hole accommodation. We used to use this rather often, and it didn’t harm us. This time we’ll not stay in Lixin, so nothing to fear! By the way, from four black holes onwards you would have to share your bed with small animals you might not appreciate. But for sure, this category is not on offer on FarRail trips. More seriously, it is very basic, but acceptable for most travellers and the rewards of being so close to the railway are wonderful. We’ll sleep on Kangs, these are sleeping platforms with a built in stove, so they are warm and quite comfortable. You’ll get some covers to put on the stove to soften it a bit. Most of the participants on other trips who have used this kind of a bed have been really surprised how well they slept! No one will remember another faceless three star hotel in a medium sized city, but when you’re staying in the total tranquillity of the forests, sleeping on a well heated stove it’s a memorable experience.